Brandon League has a bold prediction, a new contract, and a cool Halloween costume. 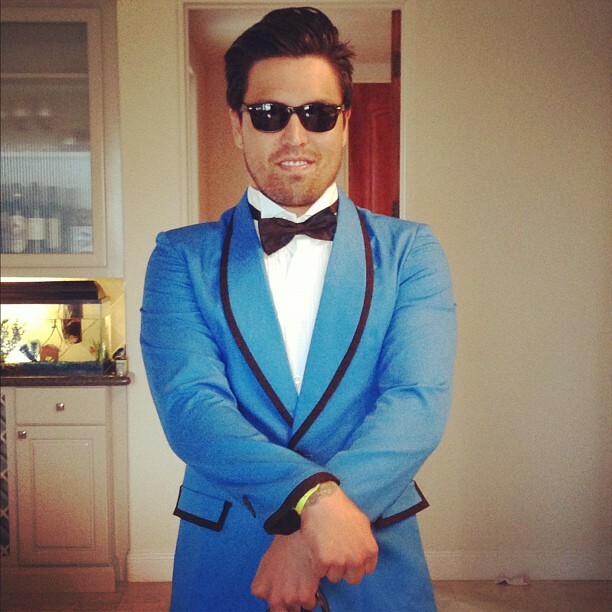 Dodgers pitcher Brandon League is dressing up as Psy for Halloween. The Korean rapper is best only known in United States for the song and music video “Gangnam Style,” a frequent champion on “Dodgers Jukebox” this year. Coincidentally, San Francisco Giants broadcasters Jon Miller and Dave Flemming were doing the “Gangnam Style” dance today — a “perk,” I suppose, when your team wins the World Series and throws a parade. Usually, another “perk” of winning the World Series is that you’re considered the favorites to win your division next season. Not in League’s opinion.